Coinbase vs Kraken: which cryptocurrency exchange is best? If you are buying cryptocurrencies for the first time, Coinbase makes it easy to exchange U.S. dollars for Bitcoin, Litecoin, or Ethereum. But if you have been around the block when it comes to cryptocurrency trading, Kraken may be a better fit because of its lower fees, higher limits and broader range of trading pairs. Beyond fees, ease-of-use, and the range of cryptocurrencies available, what else do you need to know when comparing Kraken vs Coinbase? Where To Buy Cryptocurrencies: Kraken or Coinbase? Coinbase makes it easy to buy and sell cryptocurrencies. With a credit card or debit card, or even a Paypal account, you can purchase Bitcoin, Ethereum, or Litecoin quickly. And unlike some digital currency exchange platforms, Coinbase has a polished interface so it’s hard to get lost on the website. But the greater convenience comes at a price, which is higher fees. When you use a credit card to buy digital assets, Coinbase will pass on the fees charged by credit card companies to you. You can pay lower costs by choosing bank transfers, but the fees are still higher at Coinbase than at many other digital exchanges. At Coinbase, it is simple it is to convert U.S. dollars or other real world currencies to cryptocurrencies. Many digital currency exchanges make it easy to convert from one cryptocoin to another while Coinbase simplifies the process of converting U.S. dollars to bitcoins, litecoins, or ethers. The bottom line is Coinbase is more friendly to novice crypto-investors but the simplicity comes at the cost of higher transaction fees. Kraken is a digital currency exchange and, like Coinbase, is based out of San Francisco. Where Kraken has the edge over Coinbase is that fees are significantly lower. You can think of Kraken as being similar to a forex exchange. The range of digital currencies available to trade is much more extensive than at Coinbase. For example, you can trade the XBT/USD pair to exchange dollars for bitcoins, or a wide range of other cryptocurrencies. But where Coinbase makes it easy to use a credit card or debit card, or Paypal, to purchase cryptocurrencies, Kraken requires you to deposit funds via bank transfer. The process can take a few days, which means you need to wait patiently while funds settle. If you want to buy cryptocurrencies at today’s prices, Coinbase is your best bet. Once you have cryptocurrencies in your account at Kraken, you can exchange them easily and cost effectively to other cryptocurrencies. But don’t expect the simplicity of Coinbase when it comes to the user interface. 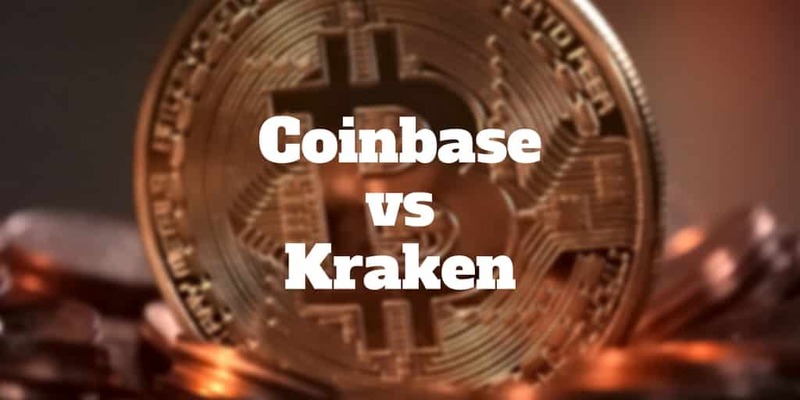 Kraken may be a venture-funded company, but it is dwarfed when it comes to the amount of money it has in its coffers compared to Coinbase, which has raised hundreds of millions of dollars. All that money from top tier investors bought Coinbase not only a reputation as the premier digital currency exchange, but also the deep reserves needed to build a platform with a world class user experience. The higher fees charged by Coinbase make it more suitable to investing while Kraken rewards users who transact in high volumes, and is a better platform for active traders. If you wish to do a wire transfer, it will cost you $10 but ACH transfers are free. The most notable fee is the credit card or debit card fee. Coinbase passes on credit card company processing fees to users. So, although it is expensive to invest in cryptocurrencies at Coinbase, it may still be affordable when holding for the long-term whereas trading frequently could quickly become prohibitively costly. 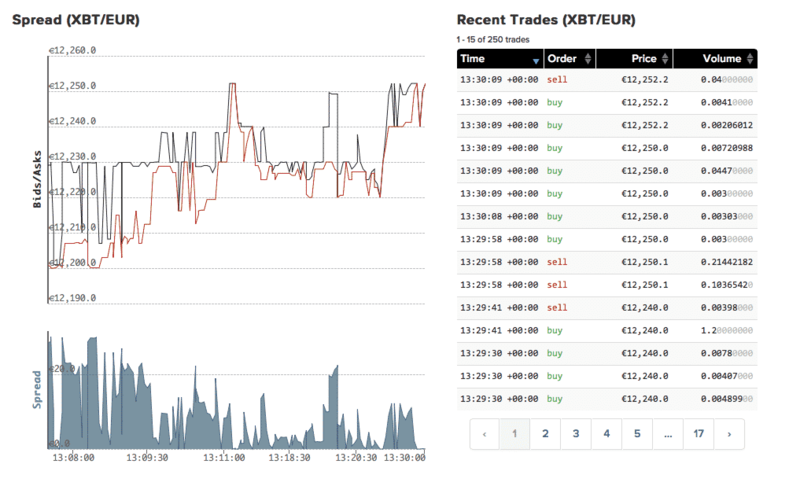 Kraken rewards traders with lower fees when they trade higher volumes. Fees are charged on a per trade basis and calculated as a % of the trade’s quote currency volume. 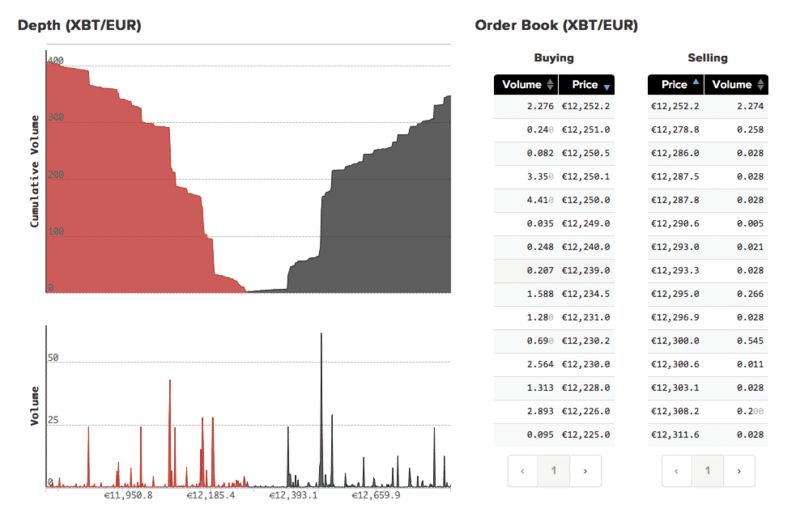 User fee volumes are calculated using trades over the previous 30 days only. Coinbase makes it easy to buy cryptocurrencies at the price quoted the day you sign up while Kraken will make you wait until your funds settle before permitting you to transact. By permitting you to purchase cryptocurrencies via credit card, debit card, and Paypal, Coinbase makes is possible to transact on the same day you sign up. You will be required to verify your bank information in order to buy Bitcoin, Ethereum, or Litecoin, and you can transact at the price quoted on your screen. If you choose to pay by bank transfer, you will need to wait for a few days until funds settle in your account. 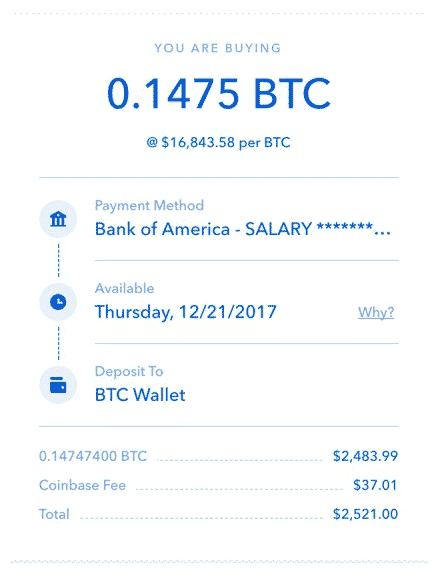 The order screen at Coinbase will look similar to the one shown below. You will be quoted a price for the cryptocurrency, the amount you will pay, and the payment method used. It’s easy to see how much you will pay in fees too. When you first sign up to Kraken, you will need to make a deposit of U.S. dollars or another currency in order to purchase a cryptocurrency – assuming you don’t have a cryptocurrency wallet elsewhere. It may take a few days for the funds to settle in your account, so you will not be able to buy coins on the same day as you sign up if it’s your first time purchasing digital coins. Where Kraken is a bit more complicated than Coinbase for beginners is that Kraken provides a cryptocurrency exchange platform, similar to a forex exchange. Kraken pairs currencies together. For example, the Bitcoin-U.S. dollar pair is one example of many that you can trade on the platform. For each currency pair, you can view the historical order flow. And you also get to see the depth of market. Coinbase security and Kraken security measures are designed to minimize risk by storing sensitive data and a majority of digital assets offline in cold storage facilities or safe deposit boxes. Coinbase claims that approximately 98% of customer funds are stored offline. By storing assets offline, digital assets are largely inaccessible to online hackers. Coinbase then distributes Bitcoins geographically in safe deposit boxes and vaults around the world. The idea is to break the link between sensitive data and online access, so valuable information cannot be easily compromised. When you log in as a customer, you will be encouraged to set up a two-factor authentication system. In addition to your username and password, you will need a passcode (6 digits long) that changes every 30 seconds and is visible only on your mobile device. If you fail to type in the digits quickly enough, the code will change, and you can enter the next set of random digits that appear. Kraken protects sensitive user information by encrypting databases and making them inaccessible from the main Kraken website. It also encourages uses to set up two-factor login authentication and create a master key. It is also possible to add a global settings lock to your account. Kraken holds full reserves that are developed using state of the art systems for heightened protection. Another security measure will be triggered if you login from a different IP address than your usual one. The idea is to combat session hijacking. As with most digital exchanges, cryptocurrency funds are generally stored in cold storage units offline for maximum asset protection. ✅ Easy To Invest: Coinbase accepts credit cards, debit cards, and Paypal, making it easy to invest in cryptocurrencies. ✅ Fees: Transaction fees are significantly lower than the fees charged by Coinbase. ✅ No Delays: You can purchase cryptocurrencies at the prices quoted the day you sign up at Coinbase whereas at Kraken you will need to wait until your funds are deposited unless you have an existing cryptocurrency wallet. ✅ # Of Cryptocurrency Pairs: Kraken supports trading in approximately 50 cryptocurrency pairs whereas Coinbase supports Bitcoin, Bitcoin Cash, Litecoin, and Ethereum. ✅ Security: Coinbase stores about 98% of customer assets offline in safe deposit boxes that are geographically diversified for maximum security. ✅ Good For Active Traders: Kraken provides fee discounts to active traders based on the volume of transactions traded over the prior 30 days. ✅ Two-Factor Authentication: Coinbase employs two-factor authentication for heightened security. ✅ Two-Factor Authentication: Kraken also provides uses two-factor authentication for increased safety of funds. ✅ Cryptocurrency Wallet: Coinbase provides a free cryptocurrency wallet where you can store your digital assets. ✅ Cryptocurrency Wallet: Kraken provides a free cryptocurrency wallet to all account holders. ✅ Trading Limits: Coinbase imposes variable limits which may be larger for new users than at Kraken. ✅ Cryptocurrency Exchange: Kraken is like a forex exchange, making it easy to exchange one cryptocoin for another. Coinbase and Kraken can both be used to purchase Bitcoin, Ethereum, and Litecoin. However, Kraken is best for active, fee-conscious traders who want to buy and sell cryptocurrencies in large volumes, or want to exchange assets from one cryptocurrency to another. For a simple and easy user experience, Coinbase is hard to beat. You can sign up and buy cryptocurrencies the same day using a credit card, debit card or Paypal – none of which is possible at Kraken. Both Coinbase and Kraken claim to store digital assets offline for maximum security, and both provide two factor authentication when users log in. The bottom line is if you are new to the world of cryptocurrencies, plan to hold digital assets for a longer time period, are primarily interested in the major cryptocurrencies, and want to buy and sell easily then Coinbase is your best option. However, if you are an active trader that prioritizes low fee transactions then Kraken will likely serve your needs best.